Dooley Noted Style: Guest Blogging With A C.H. Guest Blogging With A C.H. Hi Dooley Noted Style readers! I'm Christin from with a C.H. and I'm really excited to be filling in for Heidi today while she enjoys herself on vacation. 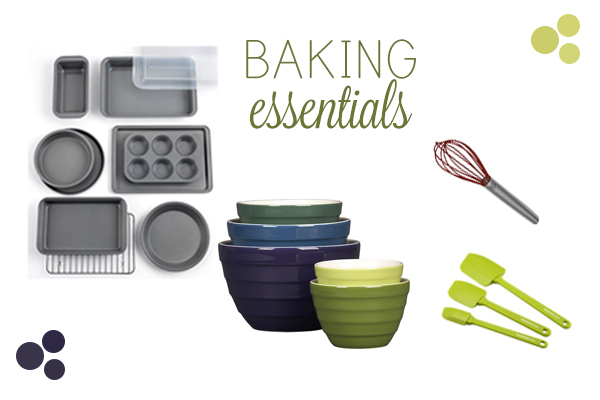 Since Heidi has told me she isn't much of a baker, I wanted to share the essentials that you need in your kitchen to whip up some muy deliciouso baked goods. Before you freak out, I really believe that essentials don't need to be Le Cruset or from Williams-Sonoma. Confession: most all of my bakeware and cookware is from Macy's and Target. Do not discount Macy's, those mofos are always having a sale! Any questions, class? Thanks for having me, Heidi! I consider myself a somewhat serious baker and quality baking pans are worth every penny. I'm a big fan of NordicWare because they're high quality and made in the USA. Thankfully, I can find their pieces often on Rue La La and at second hand stores like TJ Maxx and Home Goods. i have a fantasy where everything in my kitchen will be le creuset.. but for now, le sigh & target!